When it comes to hair care, natural is always the best. Herbs help protect the natural texture and sheen of hair when the ingredients are blended in a balanced way, so that they can address specific concerns while also protecting your hair from damage. With each passing day, our hair comes in contact with several negative triggers, leading to dryness, breakage and damage, and therefore, it becomes essential to restore the moisture and strength of our hair. Dry hair is the root causes of most hair concerns, including dullness and frizz. Therefore, a nourishing, hydrating hair mask that helps in softening, strengthening and restoring dry, damaged hair becomes essential. Nourishing hair masks can make a huge difference, adding shine and strength to your hair, while also protecting hair from harsh external environment. And, what more can you give your hair, than hair masks with well-formulated ayurvedic ingredients? In Ayurveda, hair fall or damaged hair occurs due to Pitta imbalance, and hence, several cooling oils and herbs are used in Ayurvedic hair masks. Ayurveda makes use of herbs, flowers, fruits, oils, and nuts in the masks. Further, most herbs used in Ayurvedic hair masks are also good for overall hair health, brain health, memory etc. The combination of Shikakai and Amla (Indian gooseberry) could be the ideal go-to solution to protect your hair from split-ends and breakage. Both these ingredients are rich in anti-oxidants. While amla helps in keeping your hair healthy fighting off the damage, shikakai, being a rich source of essential vitamins, promotes hair growth by nourishing hair follicles. Coconut oil, strengthens, fortifies, moisturizes, and repairs dry, damaged hair. Mix together a tablespoon each of shikakai and amla powder. Add two tablespoons of heated coconut oil to this and leave the mixture for three hours. On cooling the mixture, strain the oil and directly massage it onto your scalp and leave it on for 30 minutes before rinsing with water. 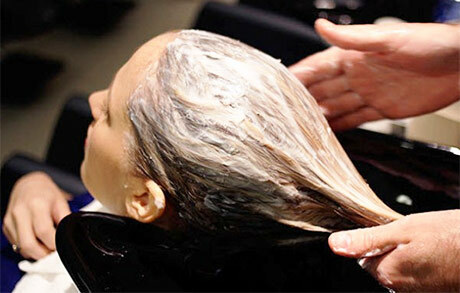 This can be done on weekly basis, and works as a great tonic to maintain a healthy scalp and good hair texture. Popularly known as ‘the King of Herbs’, the Ayurvedic herb Bhringraj is beneficial in promoting hair growth. Apart from preventing premature greying, and other hair issues such as alopecia and baldness, Bhringraj reduces hairfall and increases volume of hair. Grind the leaves and extract the juice that is blackish green in colour. Alternatively, you can also purchase the dried Bhringraj leaves available in the market, but, soak them in lukewarm water overnight and use it on the hair next day as a mask. Massage this on your hair, leave it on for 20 minutes and wash off. It may be a good idea to include neem into your hair mask if you need to address issues such as hair lice, boils, dandruff etc. While amla nourishes your hair, the antibacterial properties of neem can help get rid of boils, dandruff and hair lice. Make a paste of fresh neem leaves that has been soaked in lukewarm water overnight. Mix powdered amla to this, and use this as a mask on hair and scalp, leaving it on for 20 minutes before rinsing. Notice the results yourself. Since ancient times, fenugreek has been used for hair growth. It helps in keeping your hair well nourished, apart from keeping the scalp cool, preventing the occurrence of dandruff and dry hair. Together with amla, this can form an effective hair mask. Roast fenugreek seeds slightly, powder it and store in an air-tight jar. To use, soak a cup of this powder together with equal quantity of amla powder in lukewarm water and leave overnight. The next day, use this as a hair mask, leave it on for 20 minutes before rinsing off. Hibiscus is amazing for hair health, irrespective of whether it is used fresh or dried. They have high levels of Vitamin A, C, iron, apart from being anti-inflammatory, anti-bacterial and antioxidant in nature. Therefore, preparing hair masks with hibiscus paste, or hibiscus-infused oil, can help prevent dandruff, hair loss, add shine to your hair, conditions hair and promotes hair growth. Both flower and leaves of hibiscus can be used for making a hair mask, although flower may have more nutrients. Make a paste of hibiscus, add in a tablespoon of fenugreek powder or two tablespoon of yogurt and combine well. This mask combats dandruff and prevents premature greying of hair. Reetha has always been considered as natural shampoo, cleanser and conditioner. It helps arrest hair fall, and adds volume and shine to hair. Reetha is also effective in fighting dandruff and dry scalp, while its anti-microbial properties make it effective in fighting head lice too. Take equal parts of Ritha and Shikakai and make a paste. Use this as a mask for 20 minutes and rinse off. Alternatively, take 100gm each of powdered Reetha, Amla and Shikakai and boil in two litre of water, until the quantity reduces to half. Strain this water and use it as shampoo.